Preventive dental care is essential to helping patients keep their healthiest smiles for life, and the Renu Dental team in Crookston, MN make general and preventive dentistry the top priority for our patients’ treatment planning. We recommend patients visit us at least two times each year in keeping with the American Dental Association’s recommendations. Whether it’s been six months or six years since your last visit to the dentist, we invite you to start down the path to a healthier smile by contacting our skilled dentistry team to schedule an appointment today. We welcome Crookston residents as well as patients from Fisher and other nearby communities. At these regular visits, we’re happy to answer questions, explain or demonstrate proper at-home hygiene, and make recommendations to protect or improve oral health. Most importantly, visiting our office regularly allows Dr. Jaclyn Jensen and her team to become familiar with your smile and recognize changes in earlier stages. While brushing and flossing are essential parts of maintaining a healthy smile, some patients still struggle with keeping the deep pits and grooves of their back teeth completely clean, resulting in the creation of cavities over time. Thankfully, dental sealants create a barrier between tooth enamel and the potentially damaging effects of bacteria. Bacteria live in the mouth and are essentially harmless, but like all living organisms, they digest nutrients and excrete waste. The sticky, acidic byproduct of bacteria is called plaque, and it is the cause of tooth decay and gum disease. Dental sealants prevent plaque from building up and keep tooth enamel strong. Bruxism, unconscious teeth grinding and clenching, typically occurs during the night as patients sleep. While grinding teeth during the night may seem like a relatively innocuous habit, it’s possible for patients to do a great deal of damage to their teeth if bruxism goes untreated. We offer patients comfortable, custom crafted nightguards to protect their smiles. Worn during the night, these mouthguards allow the jaw to rest in a comfortable position which reduces the amount of grinding, and the guards place a physical barrier between teeth that keeps them from rubbing together damaging dental structures. 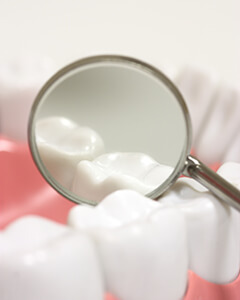 Oral cancer screenings are an essential part of every dental checkup for all our patients. Many of those we see think only patients who use tobacco need to be screened for oral cancer, but actually, more than 30% of patients diagnosed with oral cancer don’t engage in any of the behaviors that increase patients’ risk to develop oral cancer. According to the Oral Cancer Foundation, the best way to decrease the number of annual deaths attributed to oral cancer is to diagnose and treat the disease in earlier stages. That’s why we included screening for oral cancer as part of every checkup. While teeth develop, the tooth enamel is strengthened by fluoride absorbed in fluoridated water and foods. However, once teeth erupt, topical fluoride is necessary to keep enamel strong. In most cases, fluoridated toothpastes and mouthwashes are adequate to keep teeth strong. For younger patients who are still developing oral hygiene habits and adults who are prone to decay, professional grade topical fluoride treatments help strengthen tooth enamel making smiles strong and decreasing the risk for tooth decay. Sleep apnea, the cessation of breathing for ten or more seconds at a time, is not necessarily linked to dentistry for most patients. However, dentists who have advanced education and training in the inner workings of patients’ oral and facial structures are uniquely qualified to offer effective treatment for obstructive sleep apnea which occurs when patients’ airways are physically blocked during the night. We offer a simple, effective solution to sleep apnea for our patients – oral appliance therapy. These custom crafted mouthguards worn during the night reposition the jaw slightly forward keeping the airway clear.